Amir Khan suffered his second successive defeat as he was stopped in round four by unbeaten American Danny Garcia in Las Vegas. "We got a little complacent and he took advantage," Khan said. "It wasn't my night. After watching the replays a little bit I thought I was coming in with my hands down. "I respect Danny, he was countering very well against me." It is the third defeat of Khan's career and comes after his disputed loss to Lamont Peterson where he was he was beaten in controversial circumstances last December with a rematch scrapped after the American tested positive for synthetic testosterone. Following this crushing loss the Bolton boxer was taken to hospital for a precautionary scan. And the defeat casts significant doubt on his plans of moving up to the welterweight division to face the likes of unbeaten American Floyd Mayweather. 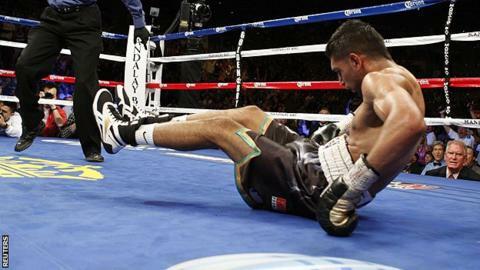 "I was a little surprised the referee stopped [the fight]," Khan added. "I thought he was going to let us continue. "My mind was clear and I thought my legs were OK but I respect the referee, the judges and the commission, maybe they made the right call." Garcia, 24, said: "We knew Khan was going to come out fast because he thought I had no power but I waited and stepped up to use the power and speed I have, and it worked. "I was going to fight until the death, just like he did. Now I want to continue to fight the best." Garcia was actually trailing early on - and cut over the eye - when the fight exploded in the third round. A counter left from Garcia floored Khan hard, despite hitting him in the neck, and although Khan got to his feet quickly he appeared devoid of his senses. "The gameplan was the correct one from Amir, pick off Garcia with speed, keep him off balance, keep him turning. But it's amazing how styles make fights because Garcia prepared for that kind of thing and Khan made one fatal mistake of jumping in a little bit too much. In the end Garcia caught him the way he wanted to. The plan was to land that kind of punch and boy did he do that - he hit him hard." Referee Kenny Bayless allowed it to go on and Khan was saved by the bell as Garcia threw a massive right and a left with the Briton struggling again. After a minute to recover Khan looked in better shape for the fourth but Garcia threw huge shots in search of the stoppage and Khan was soon down again, this time from a right, which saw him trip on the rope. Khan somehow survived and amazingly began firing back as the two men stood and traded crashing blows. The 25-year-old briefly had the upper hand, landing a nice uppercut. But he was then down a third time when he was caught by a glancing left and right to the temple. Again he got up quickly, but when Bayless stared into his eyes, the referee finally decided he had taken enough.